Based on the latest reports, Sikkim has registered voter's turnout of 62 percent while Arunachal Pradesh has registered 54 perent voter turnout till 3 pm. Sikkim Krantikari Morcha President PS Golay with his wife, Sarda Pakhrin, after they cast their vote at 10-Singling under Soreng Chakung Constituency of West Sikkim. Golay has been declared the chief ministerial candidate by his party. Golay was associated with the SDF from 1994 till 2009. Golay was convicted in a corruption case and sent to one year in jail before he was released on 10 August, 2018. He was a three-time minister in the Chamling government. Golay started his rebellion against Chamling immediately after he won the assembly election on the ruling SDF ticket for the fourth term in 2009. Elections were held in a unique Assembly constituency in Sikkim. It does not exist on the map, has no geographical boundaries and is reserved for the monastic community – Sangha. The said seat is provided under article 371 (F) of the Constitution, which has separate provisions with respect to the state of Sikkim. In the 2014 Assembly polls, Sonam Lama, a representative of Sikkim Krantikari Morcha (SKM), had won the seat by a margin of 126 votes. This year, Tshering Lama has been fielded from the ruling Sikkim Democratic Front (SDF), while Karma Tashi Bhutia has been fielded as a Congress candidate. 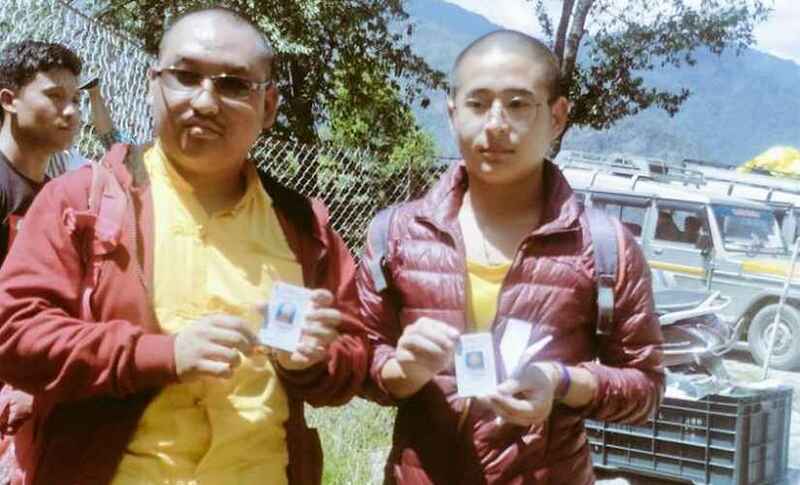 The number of voters for the Sangha seat this year is 3,293, which includes 3,224 monks, 69 nuns and the Chief Electoral Officer (CEO) of Sikkim. Buddhist monks registered with 51 monasteries in the State are the only ones who can contest and cast their votes for the unique Assembly seat, said R Telang, CEO, Sikkim. "The number of voters (in Sikkim) this year is 4,32,306 and they will cast their votes in 567 polling stations in the state. A total of 2,20,305 are males and 2,12,001 are female voters,” said Telang. Out of 567 polling stations in Sikkim, arrangements are being made for casting of votes for the Sangha seat in 51 polling stations. Three EVM’s will be placed one EVM for Assembly seat, second for Lok Sabha seat and third EVM for the monks to cast votes on the Sangha seat. Three people were seriously injured in poll violence in Arunachal's Pipsorang in Kurung Kune district after a fight broke out between workers of the BJP and the National People's Party. In Arunachal Pradesh, the ruling BJP had already opened its account in the assembly polls by winning three seats unopposed in the current election for the 60-member assembly. There are 11 independents in the fray for the Arunachal Pradesh assembly elections. In Sikkim, Andhra Pradesh and Arunachal Pradesh people are casting their votes for all the assembly constituencies. Sikkim will complete the polling a single-phase on Thursday. Former footballer Bhaichung Bhutia, who is the working president of the Hamro Sikkim party (HSP) is contesting in two assembly seats. One of the seats being contested by Bhutia is that of Gangtok which is reserved for indigenous Bhutia-Lepcha community. People of Sikkim will vote for the 32 Assembly seats on 11 April. This will be the fourth consecutive time that the Assembly elections will be held simultaneously with the Lok Sabha elections in the state. Among the prominent candidates is Chief Minister Pawan Kumar Chamling, who is contesting from Poklok-Kamrang and Namchi-Singhithang. Former footballer Bhaichung Bhutia and his party Hamro Sikkim Party (HSP) are also contesting the polls. Pitapool Model Poling Station under 16-Yachuli assembly constituency of Lower Subansiri district. A centenarian from Tajang village of Ziro with her youngest son in read coat (Village headman) joins the festival of democracy. 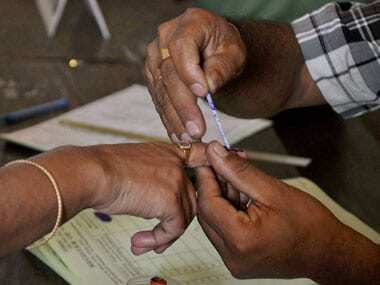 Arunachal Pradesh is voting for the two Lok Sabha seat as well as 60 Assembly constituencies. 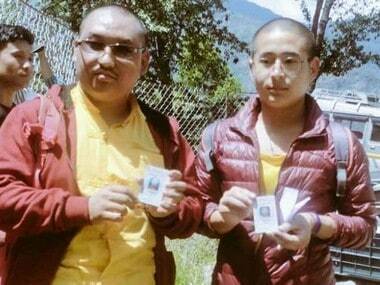 Voting was held for Sangha Assemby constituency, reserved for monks and nuns in Sikkim. The contest in Sangha is between Tshering Lama of the ruling Sikkim Democratic Front (SDF) and Karma Tashi Bhutia of Congress. Voters, majority being women, queued up since early morning even before polling began at 7 am, and a general atmosphere of enthusiasm is prevailing in most of the booths in the state. Security has been tightened in all the polling booths and there are no reports of any untoward incident from anywhere so far, police said. Prominent personalities to exercise their franchise in the early hours were former chief minister Tarun Gogoi, accompanied by his wife Dolly and son Gaurav Gogoi, who is the sitting MP and Congress candidate from Kaliabor constituency. Long queues were seen outside many booths in the state capital since 7 am when polling began. A total of 7,94,162 voters, including 4,01,601 women, are eligible to exercise their franchise in 2,202 polling stations spread across the state. Eleven polling stations have been set up exclusively for women. An electorate of over 4 lakh would exercise their franchise to elect a new 32-member Sikkim legislative Assembly. The polling timings in the state are from 7 am to 5 pm at 567 polling stations spread over four districts. Sumitra Rai, 107, the oldest voter registered in Sikkim, cast her vote in Kamrang secondary school polling station under Poklok Kamrang constituency. In Arunachal Pradesh, the BJP has fielded candidates in all the 57 assembly seats while the Congress is contesting in 46 seats and the National Peoples' Party (NPP) in 30 seats. 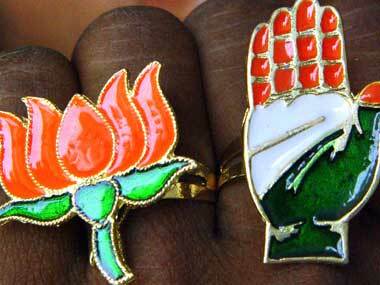 There are 11 independents in the fray for the assembly polls in Arunachal. Arunachal Chief Minister Pema Khandu is seeking a re-election from Mukto Assembly seat for the third consecutive term. Khandu is the richest among 184 candidates contesting the state polls, with assets worth more than Rs. 163 crore. Sikkim Chief Minister Pawan Kimar Chamling is contesting from two assembly seats -- Poklok-Kamrang and Namchi-Singhithang. Chamling urged the electorate to repose their faith in him to usher in development in the state. Chamling had said if his party is elected to power, he will empower the urban local bodies to serve the people in better way. As citizens que up at the polling booths, voters at Sikkim are presented with traditional scarfs as they step out to exercise their votes. To encourage women voters, the pink polling stations are managed by women officials. These booths have one presiding officer, three polling officials, and security personnel. Post the voting, women and PwD voters were presented with 'I Voted' stickers. Polling for Assembly Elections in four states – Odisha, Andhra Pradesh, Arunachal Pradesh and Sikkim, began alongside the Lok Sabha elections on 11 April. While the Sikkim Assembly has 32 seats, the Arunachal Pradesh Assembly has 60 seats. While Sikkim has 150 candidates are in the fray, Arunachal Pradesh has 181 candidates contesting from 57 of the 60 Assembly constituencies. 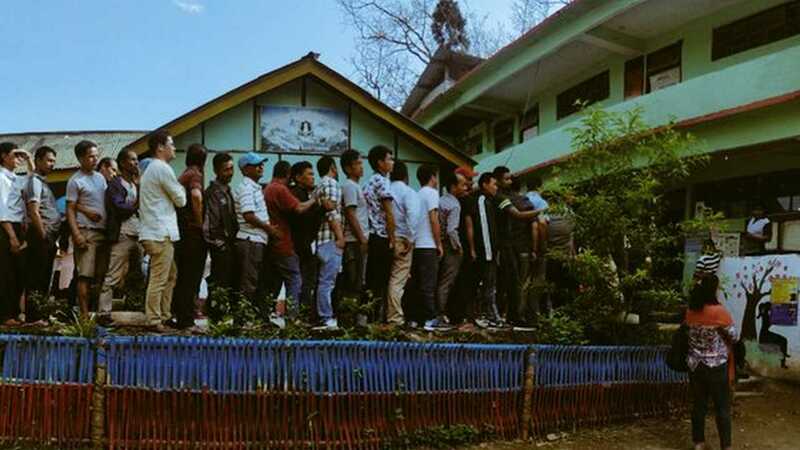 Sikkim, Arunachal Pradesh Assembly Election 2019 Voting LATEST Updates: Sikkim has registered voter's turnout of 62 percent while Arunachal Pradesh regitered 54 perent voter turnout till 3 pm, according to EC sources. 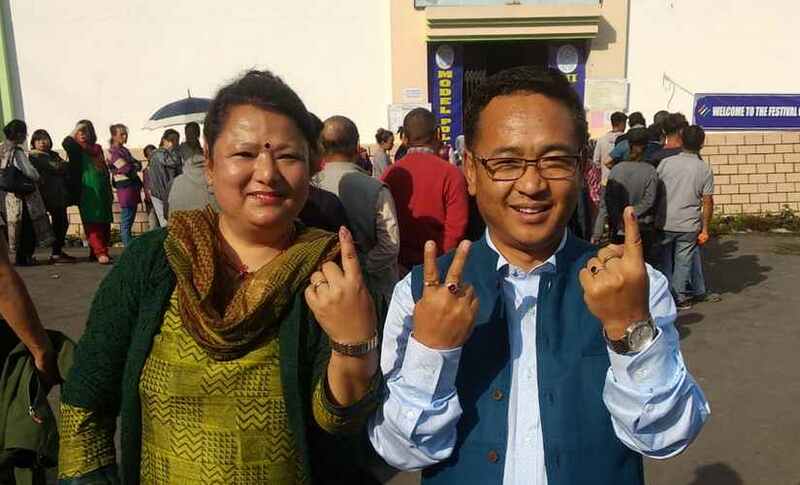 Meanwhile, Sikkim Krantikari Morcha President PS Golay with his wife, Sarda Pakhrin, after they cast their vote at 10-Singling under Soreng Chakung Constituency of West Sikkim. Golay has been declared the chief ministerial candidate by his party. In Arunachal Pradesh, an estimated six percent voters exercised their franchise in the first two hours of polling on Thursday. Working president of Hamro Sikkim Party and former footballer Baichung Bhutia cast his vote at Pangthang, East Sikkim. The Election Commission has established 6 pink polling booths in the west district of Sikkim. They are completely managed by the women staff in the district for the Assembly election. M. Lokesh, Deputy Commissioner, told presspersons that the all the staff at these stations, including presiding officers and polling officers, will be women. Even female security personnel will be deployed here. The polling stations will be painted in pink hues and the staff will also be attired in pink. He said the objective behind the establishment of pink polling stations was to motivate women voters to exercise their franchise, reports The Hindu. Over four lakh voters in Sikkim and around 8 lakh voters in Arunachal Pradesh will elect the Legislative Assemblies in their respective states on 11 April. While the Sikkim Assembly has 32 seats, the Arunachal Pradesh Assembly has 60 seats. Polling will begin at 7 am in both the states. In Sikkim, 150 candidates are in the fray. Among the prominent candidates is Chief Minister Pawan Kumar Chamling, who is contesting from Poklok-Kamrang and Namchi-Singhithang. Former footballer Bhaichung Bhutia and his party Hamro Sikkim Party (HSP) are also contesting the polls. Bhutia will contest from two seats, including Gangtok. The state has 4,32,306 voters, comprising of 2,20,305 males and 2,12,001 females. The number of first-time voters is 30,480 and the 2,042 People with Disabilities (PWD) voters have been registered. The state will have 567 polling stations spread of four districts. In Arunachal Pradesh, 181 candidates are contesting from 57 of the 60 Assembly constituencies. BJP candidates were elected from the Along East constituency in West Siang district, Yachuli seat in Lower Subansiri district and Dirang seat in West Kameng district. In the remaining 57 seats, BJP, Congress, Conrad Sangma’s National People's Party (NPP), Janata Dal (Secular), Janata Dal (United), People's Party of Arunachal (PPA) and the All India Party (AIP) have fielded their candidates. There are also 11 independents in the fray for the assembly polls. While 39 polling stations in Sikkim will be manned by all-women personnel, Arunachal Pradesh will have 11 polling stations exclusively for women. As many as 3,600 polling personnel and 4,000 security men, including 10 companies of SSB, have been deployed for election duty in Sikkim. At 120 polling stations which have been identified as critical, Centre Para Military forces will be deployed to supervise security arrangements. Over 13,000 polling personnel have been engaged in Arunachal Pradesh and 45 companies of Central Armed Paramilitary Forces (CAPF), comprising ITBP, CRPF, along with over 7,000 state civil police personnel, have been deployed to ensure free, fair and peaceful elections in the state. The state has 281 vulnerable polling booths and 662 critical polling stations. Maximum security personnel have been deployed in insurgency-hit Tirap, Changlang and Longding districts. While the Luguthang polling booth under Mukto constituency in Tawang district is the highest polling station located at an altitude of about 13,583 feet, the Hayuliang constituency in remote Anjaw district has only one voter.